The victorious 35s team. The victorious 55s side. 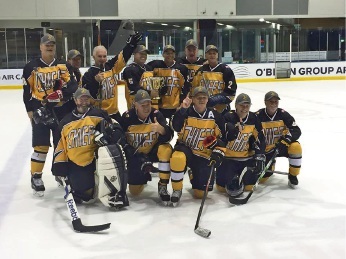 ABOUT 38 WA ice hockey players created history by winning three trophies for the first time at the national masters ice hockey tournament earlier this month. 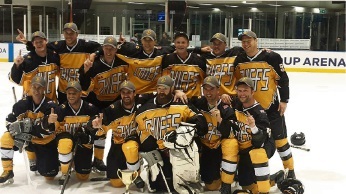 Malaga-based WA Chiefs entered over 35, 45s and 55 teams in division one and were undefeated at the annual tournament in Melbourne. WA organiser and over 55s player Kevin Wheeler said it was the first time WA had entered three teams in the top division. “Every year we have added an extra age group and then last year we went over and we did not perform well at all,” he said. “When I got back, I made a bit of plan that everyone would play in their age group, so we added the over 55s team and brought in fresh blood to really have a go at winning at least the 35s cup, if not the other two. Wheeler said the level of hockey was very high at the tournament. “There was still quite a strong contingent of Australian guys who played local hockey here,” he said. “I knew we were going to be competitive and I knew we would be a good chance in all three age groups. Over 35s goal keeper Ken Chapman and over 55s Brett McCurrach clinched the tournament’s most valuable players awards.